Credit to image used in pin goes to Featured Brands, Calibre Art, FORSUN, eBoot, and Bilipala. – Changes were made to the original image. Whether you’re just testing out the waters or just want to learn a craft, sewing should not be complicated and intimidating. Depending on what type of sewing projects you start with, there are always plenty of tips and hacks that can make things easier. I mean besides fixing clothings, sewing can be very therapeutic and a great stress reliever. And as you know, I love sharing ideas that’ll help you out and make your life a bit simpler, so I’ve curated a list of some handy and useful sewing tools that are worth adding to your kit. They’re all budget-friendly, will save you so much time, and make projects easier. So check them out and let me know what you think! Rather than getting ordinary scissor, try a thread nippers and cutting fabric will become so much easier. It’s ideal for snipping threads, yarns, and thick fabric and can also be used for crocheting, embroidery, and quilting. This rotating cutting mat offers a 360-degree rotation on a sealed, ball-bearing base, and its mats are squishy, so they hold your fabric in place a little better. It’s the perfect mat for cutting and trimming your fabric quickly. And what you’ll love the most is that it comes with a self-healing mat that closes up after being cut with a blade. Impressive right? The thing with safety pins is that they can help you with so much. They hold pattern pieces in place, anchor seam allowances as you sew, fit fabric on the body, and secure trims. And with these colored plastic head safety pins, you can instantly add a pop of color and fun to your sewing task. Forget scissors with ripping stitches and use a seam ripper to properly and quickly finish your task. You’ll love this colorful seam ripper that comes in different sizes perfect for all kinds of stitches. You could easily get one here! Keep all your pins organized with this cute tomato pin cushion. And while it’s keeping them in place, it also keeps them sharp when not being used. Usually accompanied by tracing papers, this wheel is used to transfer pattern markings. It gets patterns of all shapes and sizes perfectly copied from the paper onto the back of your fabric. They make sewing much easier and more accurate. Sewers aid is especially useful for the home sewer. By simply applying a drop to a spool, bobbin thread, and to other sewing tools you can make your machine sewing smoother and easier. This loop turner is such a simple tool that works so well. It’s a very thin metal rod with a ring on one end and a hook and latch on the other. It’s great for any project that needs to be turned right side out. To easily and precisely measure the seam allowance on your sewing machine, I highly suggest getting this seam measuring tool. Though it’s tiny, it can quickly and correctly double check your measurements effortlessly. Lastly, to complete your sewing kit, you should have a tape measure. It’s essential for taking someone else’s measurements, as well as measuring many other projects. Just keep one around your neck when you’re sewing and you’ll never have to look for it. 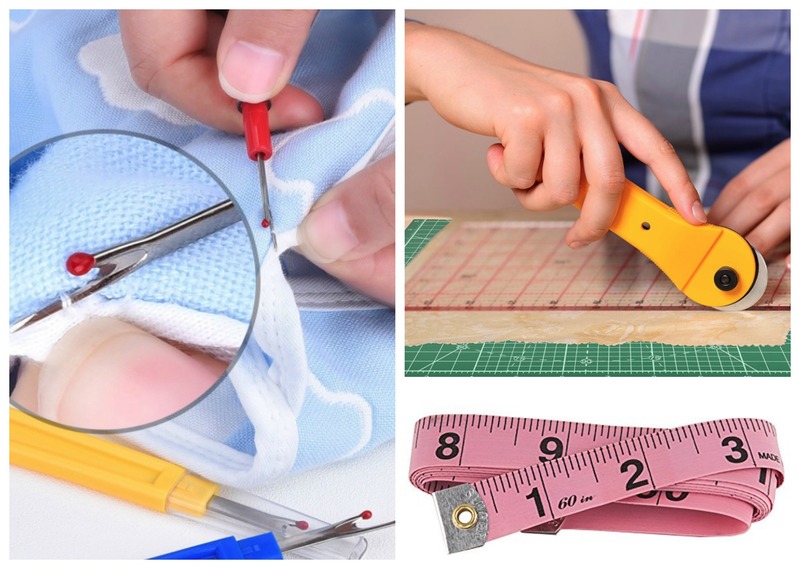 Sewing should not be a complicated and time-consuming task when you have some awesome and practical tools that’ll make your sewing more fun and simple. And these ten sewing tools from the list above will definitely help you out a lot and make things easier. So pick one, two, or three, add them to your sewing kit and get started! Let me know what you think! Now if you have any other sewing tools that you can add to the list, comment down below. I’d love to hear about them!